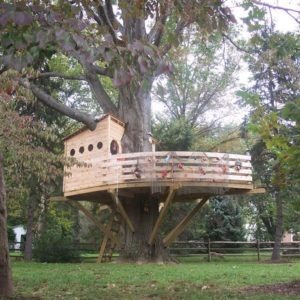 When I first met with the family, I asked their son what he was interested in and what he wanted his treehouse to look like. So, without a word, he went upstairs and retrieved a die-cast boat about the size of a matchbox car. It was hard to tell, but it looked like a fishing boat with a captains quarters on the back and steering wheel at the bow. 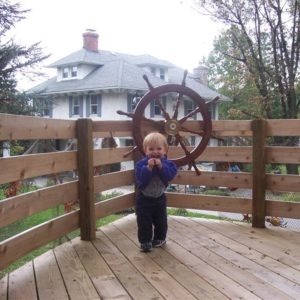 So we found a way to give the treehouse a nautical feel by the shape of the platform and the accessories which came from the internet and trips to the the Jersey Shore. While Treehouse costs vary greatly and each project is unique, we understand your need to have some idea what each project in our portfolio would cost to build. Please see our tree house pricing page for a description of the factors that go into each quote. 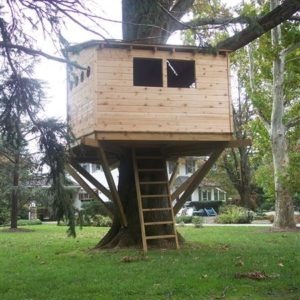 This tree house as shown would cost between $24000 and $38000. Please feel free to contact us to discuss whether your project would fall on the high end or low end of this range. Of course, if this was made like a real ship would be made, it would have cost 5-15 times as much, but we feel this gives a great look and feel of a boat treehouse for a more affordable price. We work with a ship builder when more authentic nautical craftsmanship is required.